DHA Gujranwala proudly announces booking of 5 Marla Residential Plot Files from 26 December 2017. Booking Application Forms can be downloaded by clicking Here. Forms are also available at our office as well as branches of Askari Bank, Bank Of Punjab, Soneri Bank, and United Bank Limited. DISCLAIMER: Files will be provided to successful candidates after balloting ONLY. DHA Gujranwala has not issued/ allotted any quota/ files to any person(s)/ party/ Property Dealer(s), Investor(s) etc. Any one buying files from any 3rd party before balloting shall be liable to fraud and may do any such trade of files at their own risk. Atif bhai what is next step? how i can get the file of plot?i have to submit 3 lakh Rs then file will be sent to me or i have to go guranwala fo file? DHA send you intimation letter, that is your file. intimation letter will be send to me after submission of 3 lakh Rs? Yes DHA will start sending letters after submission of down payment. 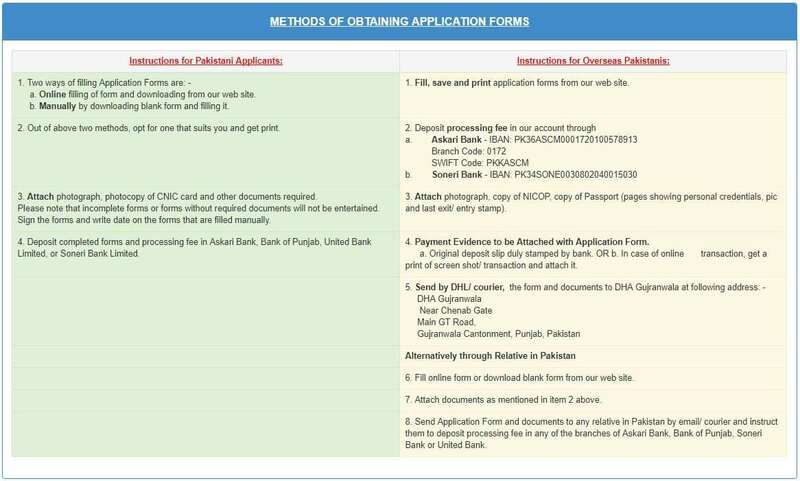 When i will receive my file i have already made the down payment… has dha started sending files and will they send on the address on the application submitted? DHA will start sending letters after 19th April. Last date of dues submission is 19th April. Yes DHA will send intimation letter on given address. Please contact DHA Gujranwala directly for further assistance. It is just a confirmation that your application is being received by DHA Gujranwala. Yet ballot is not done. Soon booking ballot will be done. Dear Atif Bhai Does this 2 Mn of 5 M include all charges like development charges, If not then how much more as dev charges are to be given? Next what is the likely future price of 5 M after 21 months and after development? It is without development charges. Development charges will be started once plot ballot is done. I am very hope full for DHA Bahawalpur ballot in 2018.
i have applied for 5 Marla plot through Askari Bank how i can my application number allocated by DHA authorities. Your form has been submitted, now wait for booking ballot. If you will be successful you get message from DHA Gujranwala. DHA Gujranwala Proudly announces launch of 5 Marlas Residential Plot Files from 26 December 2017. Application Forms can be downloaded by clicking Here. Forms are also available at our office as well as branches of Askari Bank, Bank Of Punjab, Soneri Bank, and United Bank Limited. Forms duly filled with documents and pictures, required for each category, can be submitted in above mentioned 4 branches. Last date for Submission of Applications for 5 Marla Plot is 19 January 2018. DHA Gujranwala, DHA Multan & DHA Bahawalpur are Lahore Chapter. Plz suggest.what is future of 5 marla dha gujranwala. Future is bright, project time frame is 21 month for cost of land, if assume development charges schedule is 2 yeats then it will be a 3.75 year project time. Usually DHA give 3 years for cost of land and 3 years for development charges. DEAR AATIF BHAI .. SALAM.. I WANT TO KNOW THAT IS THERE ANY EXPECTED FUTURE PROJECTS OF DHA FAISALABAD? IF YES THAN HOW IT NEAR? There is no such official information available about DHA Faisalabad. Also there are no rumors about DHA Faisalabad in near future. However Faisalabad it an important and among big cities in Pakistan, DHA and other reputed developers should consider it. Please guide me about the expected rate of return(Profit) after completion of the installment. I mean to say if i pay 2 million how much can i get after the possession of plot? or if i want to sale after 6 months or 1 year of balloting. You can sell when ever you want, but it is not recommended to sell before down payment at least. Actually booking prices are design for persons who cannot pay cash but in installment. If you think you will not be able to pay the installment completely. Please avoid booking and let give chance to others. salam, can a british passport holder invest ? Yes British Passport holder can invest as far as he / she has Overseas Pakistani Identity Card. Sir, I am retired army person and presently doing Job at Lahore Cantt. I desired to forwarded my application for allotment of 5 Marla Plot. Can I also forwarded application of my wife or Daughter separately? My permanent address is Faisalabad and can I mentioned address on application of my present setup (Job Place) both of my and my wife? Please advise me about this. With Thanks. I dont think there is any restriction by DHA for Army person family. Also you should give address where you can received mail easily from DHA. Is there any restriction on number of applications again single ID card? or i can submit any number of application again same ID? There is no restriction as per my information. What is your opinion about investing in 5 Marla , if i pay one r two installments and Sale after it , can i get gain ? Installment packages are not design for this purpose, these are design to give opportunity to a person who is unable to buy on cash payment and has got a facility to make an asset in installment plan through his / her savings. It is a good opportunity for a person to make an asset in price of 20 lacs in 21 month payment time. It is recommended for investment if one can complete its installment plan.